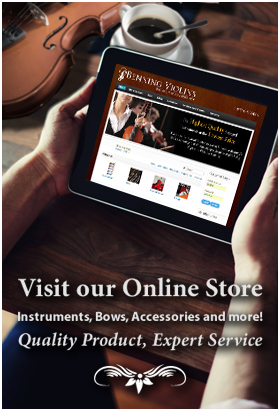 Careful installation of the bridge is necessary to achieve proper sound, tuning and maintenance of violins, violas or cellos. A poorly installed bridge will warp, break, and could result in damage to the strings or the stringed instrument itself. When instruments are shipped, the bridges are not placed on the instrument, because they can be damaged in shipment. 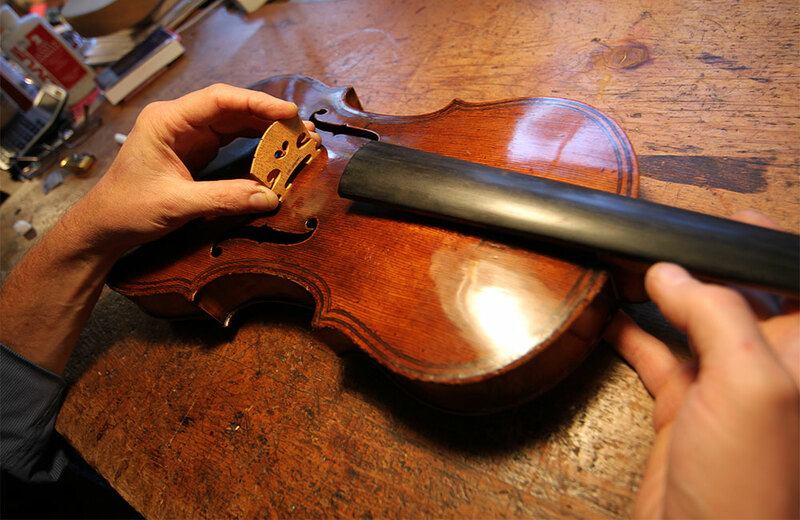 Frequently, the bridge is hidden under the tailpiece for safekeeping, and the new owner will need to install the bridge him- or herself or take it to a local violin shop for proper installation. To install the bridge, first, strings must be loosened by detuning them from the tuning pegs. Next, the bridge is placed beneath the strings. The strings should remain on the fingerboard close to their original placement. Next, the strings are re-tightened so that placing a finger between the string and the fingerboard can make about half an inch of slack. The straight side of the bridge should be placed towards the tailpiece, while the curved side is towards the fingerboard. The feet of the bridge are then placed directly between the two notches on the F-holes. The top of the bridge is tilted upwards towards the strings. The bridge has four notches, one for each of the strings to fit in. Each string is moved to its corresponding notch in the bridge. Next, each string is tightened more, although not to its correct tuning yet. The purpose is to keep the bridge from receiving a lop-sided amount of tension. As the strings are tightened, the bridge will tilt towards the fingerboard. Now the bridge needs to be readjusted so that the feet of the bridge lay flat against the surface of the stringed instrument. The bridge should form a 90-degree angle with the violin face towards the tailpiece. Now the strings can be tightened to their appropriate tunings.